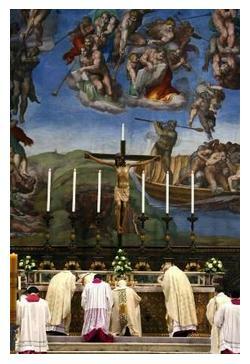 The Sistine Chapel: The New Holy Temple Of The New World Order! Of The New World Order! 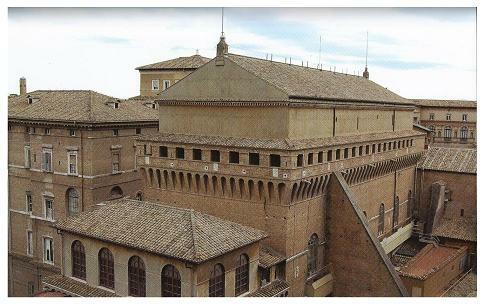 Six centuries ago a Roman Catholic architect designed and built an incredible, full-sized copy of the inner sanctum (the Heichal) of King Solomon’s Temple… and it was built right in the middle of the ancient fortress walls of Vatican City. It measured 134.28 feet long by 43.99 feet wide by 67.91 feet high, the same as Jerusalem’s First Holy Temple completed in 930 BCE by King Solomon and his architect King Hiram of Tyre (Lebanon). This massive reproduction still exists today, and it is called la Cappella Sistina or the Sistine Chapel. 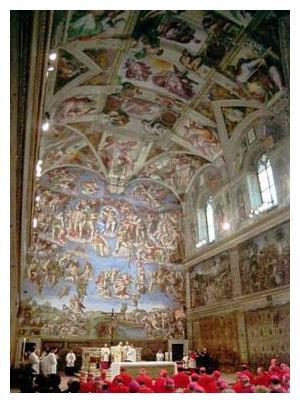 The Roman Catholic Sistine Chapel was designed and built as a replacement for the ancient Jewish Temple in Jerusalem, and even though it was something explicitly forbidden. In the ancient holy commentaries of the greatest Jewish sages – the Talmud – it is clearly legislated that no one may construct a functioning full-sized copy of the Holy Temple of Jerusalem in any location other than the Temple Mount itself (Tractate Megillah, 103)… but yet the Roman Catholic Religious System (RCRS) has done exactly that. In fact the RCRS, in their effort to simulate the sacred site that existed in ancient Jerusalem, built the sanctuary on two levels. The western half, containing the altar and the private area for the pope and his court, is about six inches higher than the eastern half reserved for the common onlookers. This elevated section corresponds to the farthest recess of the original Holy Temple – the Holy of Holies (the Kopdesh Kodoshim) – where the Ark of the Covenant and the Presence of God resided. It was in this section of the Holy Temple that the High Priest would enter once a year on Yon Kippur, the Day of Atonement, to perform the all-important prayer of forgiveness and redemption for the people. Now with that in mind, can I show you a very scary thing? 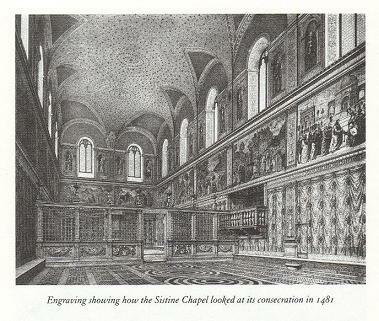 The Sistine Chapel was built for the god of the Roman Catholic Religious System. The Sistine Chapel is the New Holy Temple of the New World Order located in the New Jerusalem of the city of Rome… that is until the final Temple is rebuilt in Jerusalem where the god of the RCRS will take his throne. So, are you a part of the Roman Catholic Religious System? Do you really want to get to Heaven?